Pat Martino is one of the greatest players to ever pick up the guitar, and studying his material may seem like a daunting thing to tackle. But, by breaking down his solos into phrases, analyzing those phrases, and taking the underlying concepts to your own playing, you will be able to get that legendary Pat vibe in your solos. Pat Martino emerged as a jazz guitarist in the sixties, releasing his first album El Hombre in 1967. He made a remarkable comeback at the beginning of the eighties. After undergoing brain surgery he had complete amnesia and forgot how to play guitar. It took him years to recover and get back to his old form, partly by listening to his old records. The first record he released after the post-amnesia period was The Return. 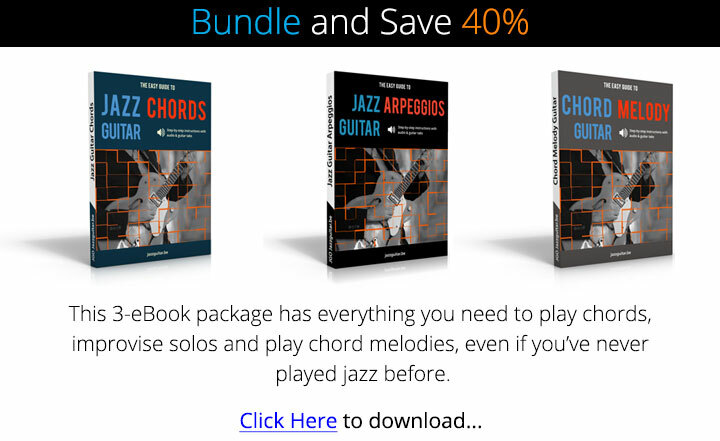 Download now and learn 244 chord shapes! Sunny, a song written by Bobby Hebb in 1963, is one of the most performed and recorded pop songs. It was written as a tribute to John F. Kennedy, but also to Bobby Hebb’s brother, who was killed during a mugging on the same day Kennedy was murdered (November 22, 1963). Sunny was performed and recorded by hundreds of artists, including Marvin Gaye, Stevie Wonder, James Brown, and Shirley Bassey. The song also found its way into jazz repertoire, played by jazz greats such as Frank Sinatra (with Duke Ellington), Wes Montgomery, Ella Fitzgerald, Stanley Jordan, Jimmy Smith and Oscar Peterson (with Joe Pass and Ray Brown). The most legendary Sunny version among jazz guitarists (besides Wes Montgomery’s) is Pat Martino’s recording on his album Live! (1972) because of the amazing solo that spans nearly 5 minutes. In this section, you will learn 5 licks transcribed from Pat’s solo. The first concept to explore is the opening four notes of the line (A-B-G#-A). These four notes come from the A melodic minor scale, which is a sound Martino often explores over m7 chords in his solos. From there, you’ll see a Bb passing tone in the second beat of the Am7 bar, which is inserted into the Dorian mode used to outline that chord in the line. You’ll also see the G melodic minor scale used to outline the Gm7 chord, with the F# note highlighting that scale choice. Lastly, check out the Bb-C-D-F notes over C7, which is a 1235 pattern from the b7 of that chord. This pattern is not only found in Martino’s playing but is also a favorite of John Coltrane, heard most famously in his solo on the jazz classic Giant Steps. 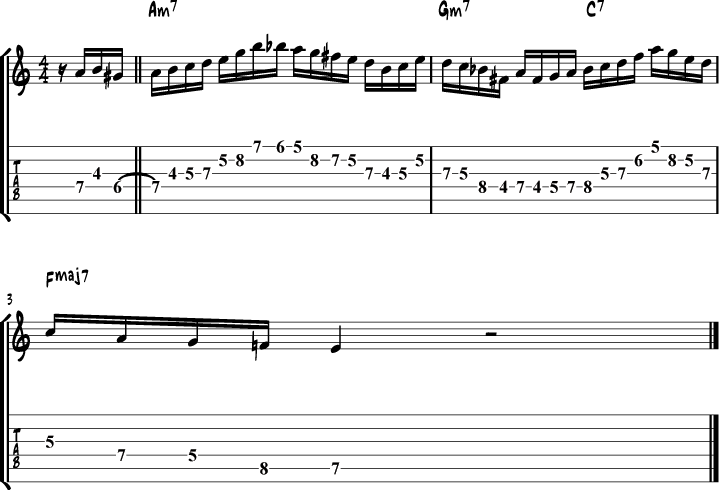 Apart from the bebop influence at the end of this Pat Martino lick, you’ll see a repeated melodic phrase repeated throughout the first five and a half bars of the line. Repeated a short phrase such as this is not only a characteristic of Martino’s soloing concept, it’s a great way for you to increase the intensity level of your own solos. Practice taking this melodic pattern, heard in the second half of the Am7 bar at the start of the line, and repeat it when soloing in your practice routine. From there, come up with your own melodic phrase to repeat in your solos. The key is to use the repeated phrase to build energy, but know when to move on in your lines so that the lick doesn’t become overdone. This is a tough line to walk, but if you can do it then any repeated line such as this becomes a powerful tool in your improvisational tool belt. Apart from studying single-notes when digging into Martino’s soloing concepts, you’ll also want to dig into his use of double-stops and chords in his soloing phrases. You can see two and three-note shapes being used in this line to create energy throughout the phrase. 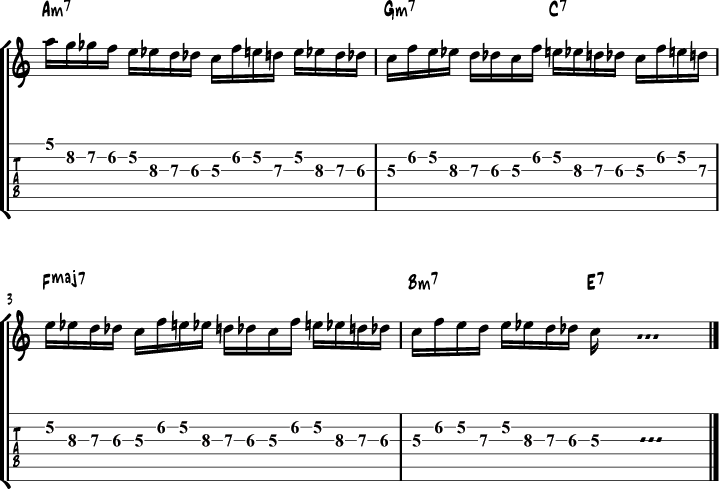 As well, there is a repeated melodic phrase used in this line, combining two of Martino’s favorite concepts for building energy in his improvised lines. When working on double stops on your own, you can take them from arpeggios, minor pentatonic scales, or modes in your solos. Here’s another repeated Pat Martino lick, though this time the line is not based on arpeggios or pentatonic scales, as you saw in the first two repeated lines in this lesson. Instead, the line is highly chromatic, running six chromatic notes in a row during the repeated phrase, from F down to C.
When doing so, Martino starts the lick on the 2nd 16th note of the phrase, which also gives it a syncopated feel as you repeat the phrase over a series of measures, as you can hear in the lick below. In this lick, you’ll work on a mixture of arpeggios and scale notes as you outline the changes over the tune Sunny. As you can see, there are some arpeggios that outline the direct chord that Pat’s soloing over, while others are subs that come from the related key center. Also, you’ll see a number of chromatic passing notes, such as the Ab, Eb, and Db notes in the second bar of the line. Though it’s not always the case, often Pat Martino will play skips (arpeggios) up, followed by steps (scales or chromatic notes) down. This helps balance the line and keeps the listener guessing as to what’s coming next in the line. The first lick is a V – I minor key phrase that uses the C harmonic minor scale to outline the b9 and b13 intervals over the G7 chord in the progression. If you want to take this concept further, try putting on a G7-Cm7 backing track and improvise over those changes using the C harmonic minor scale to build your lines and phrases. If the second chord would be a major chord, change the last note to an E natural in order to resolve it to a Cmaj7 chord rather than a Cm7 chord. This lick uses a simple rhythmic idea (a three-note 8th-note pattern) which is repeated to create a syncopated feel throughout the line. Though it is simple on paper, getting this lick even and repeating is for longer periods can be tough. Go slow, use a metronome, and nail the rhythm for each note in your studies. Pat used repeated licks to build energy, especially in the drums, and while it may be a cliche now, this is still a classic lick that’s worth adding to your vocabulary. This minor lick is built around a C major arpeggio, a common substitute for Am7. Starting maj7 arpeggios on the 7th and moving up the 1-3-5 from there is a commonly used jazz phrase that you can explore further. There is also an Em7 arpeggio in the last four notes of the phrase, which highlights the 5-b7-9-11 of the underlying Am7 chord. This is another arpeggio concept you can take from this lick and work it in other keys and over other chords. 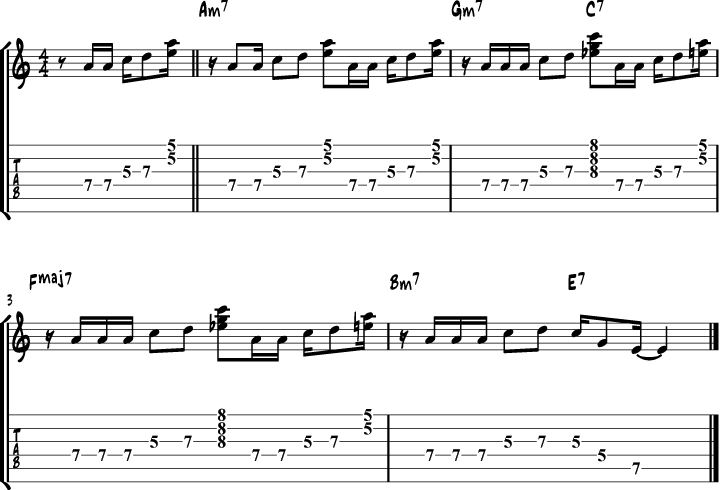 This Pat Martino Lick is also built around a C major arpeggio over an Am7 chord. The opening four notes (7-1-3-5) are a common arpeggio pattern used by Pat and other jazz legends. 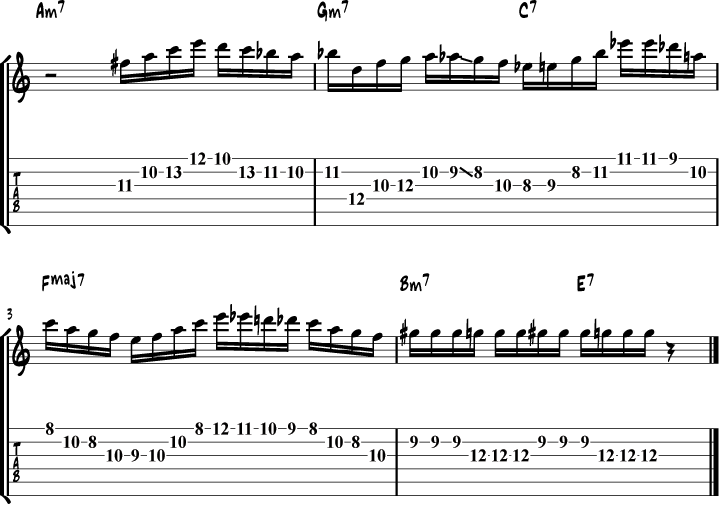 This lick is a real classic that is inspired by the material Pat presented in his jazz guitar book Linear Expressions. If you are interested in Pat’s playing, then owning and studying the soloing concepts in this book is essential. Hi Chris. All of the examples come from the video at the start of the lesson, and the time of each lick is indicated at the start of each lick section. Cheers. It does seem as though he can’t stop playing sixteenth notes. I have to agree. Too many notes, entirely unmemorable. A music teacher once said to me: “Remember, music is an art, not a sport”. I heard Martino play a solo gig at a bar in Madison Wisconsin around 1974. The only tune I remember from the gig was Sunny, and it was stunning. He was playing solo, so he didn’t get as single-minded (in terms of harmonic ideas) in that set as he did in this quartet performance, which made it slightly easier to follow for me. But it was a vivid experience. I got to talk with him a while about his setup (he had an L-5 and I had a now-illegal Ibanez copy of an L-5). He had a soundpost under his bridge, and the body was stuffed with some sort of insulation to block feedback. The f-holes were covered from the inside with black felt, so it looked just like an empty L-5. I followed that for a while, although it was sort of pointless because I don’t think I ever played loud enough to get feedback. But a great guitarist. A sort of loony philosopher, though, if you forgive my saying so. I advise you to IGNORE his long discussions on Youtube of his philosophical insights. Listen to his guitar instead. I agree with you. Maybe his best CD is Live. Hi Paul, there is a youtube video just above the first lick. Can you not see that video on your browser? Let us know. Nice solo, but sometimes less is more. Absolutely phantastic solo. Thanks to you guys for transscribing parts of it. I cant’n get enough of it! instead of being critical try to stop and listen for the inspiration and learning… Each accomplished musician has his own rationale and thinking and expression … so don’t knock him because his ideas are not the same as yours…. is having the maturity to understate and leave something for the listeners imagination.heh.just one mans opinion.great site though. Neilo. Such a pleasure to dig ideas in this site !!! This solo is both really inspiring and exciting and, although I’m far from beaing able to catch it all, there ‘s so much to get from it ! Thank’s a lot for all you can learn to us ! No words… fantastic solo! Guitar players often use speed technique to show abilities, but here is not the case. Pat really get into the song. Fantastic! I think just like John Coltrane represents a “maximal” approach to notes when improvising on the saxophone, Pat Martino represents this on the guitar. Martino is and will always be one of the Greatest that ever picked up the guitar……..for those who need to hear more check out his playing on a ballad! This was recorded live in NY at Jazz City ( formerly Folk City ) I remember meeting George Benson’s father that night in the bathroom ! George was also in attendance . Man that’s praise . Pat Martino is an absolute genius. Totally dedicated to jazz, with strong spiritual and philosophical basis. His playing is amazing conceptually and technically, firmly rooted in be-bop tradition but he’s able to effortlessly stretch it into much more abstract forms. I was fortunate to take some lessons with Pat in NYC a loooong time ago, before his surgery. At that time he was advocating the improvisational approach based on diminished chords and arpeggios, which provided a way to go “outside”, yet be related to the underlying chords. It was quite theoretical, challenging and a bit dry, but it worked. 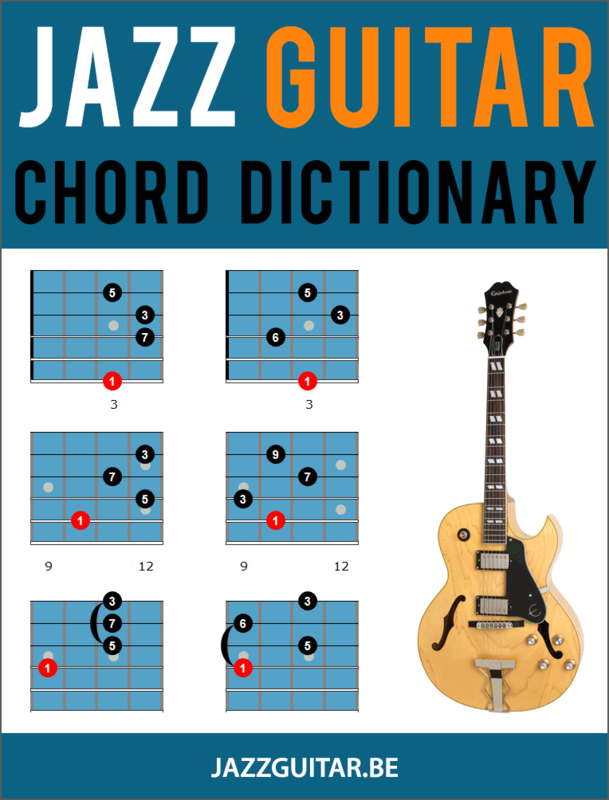 By lowering each of the diminished chord notes individually you get four different 7th chords. So, a line based on Bb dim 7 could be played over A7, Eb7, C7 and F#7 and also their related minor chords Em7, Bb7, Gm7, and C#m7, as well as their variations. The same dim line/arpeggio could be moved up and down in minor 3rds over the same chord for variety, in my view it works best if resolved into a chord note or a traditional bebop type line. Do this a half step and a full step higher and you’ve got all possible 7th chords (and their related minor 7ths) covered. On the other hand Pat presented a different, more traditional approach to teaching (based on IIm7 V7 Imaj7 ) in his book Linear Expressions, which is well worth studying. As Pat states in the book’s closing remarks, “…in music as in life itself, there are no beter ways…just different ways”. One Pat Martino album that gets somewhat overlooked is “Joyous Lake”, which came out during the peak of jazz-rock era. To me it’s one of the very best of what was issued then, a lot more jazz then rock, but with a very hard driving rhythm section. It was a departure from his usual style. In case you haven’t heard it, and even if you are not into jazz-rock in general, this album, especially Pat’s playing, will blow your mind! Give it a go. All the best to fellow jazz guitarists! 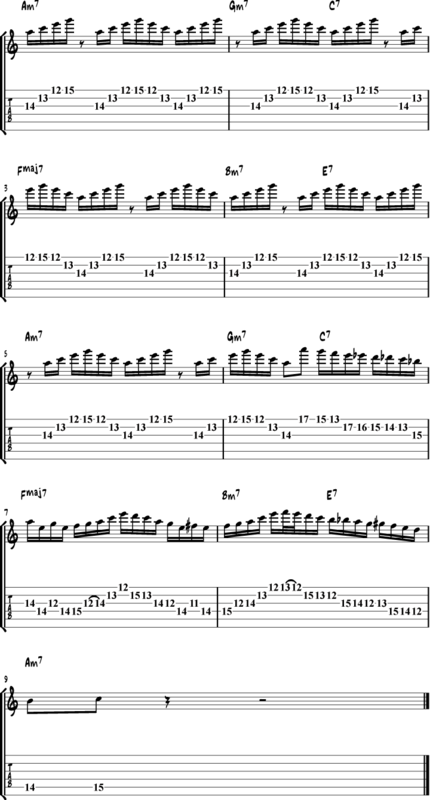 Lick #4 is just “flight of the bumblebee” quotaton…. As a practical matter, instead of melodic minor, it may be best to think of the the leading tone encapsulation figure against a minor seventh (A-B-G#-A against Am7) chords as a dominant passing chord pickup phrase (E7-Am), especially since the G# is not heard from again in the lick. It’s a simpler thought process that can be applied almost universally and is compatible with the minor bebop scale, and, also, since any major or minor chord can be preceded by its dominant. Great article! As someone who is more of a rock guitar player who dabbles in jazz, I’ve always found it easier to visualize a minor 7th arpeggio with the “blues notes” in Dorian. A pattern Pat uses a lot is 1, b3, 4, b5, 5, b7, 1, b3, 5, 6(13).